At Familia Martínez Bujanda, four generations of winemakers have grown vines and made wines with a character of their own. A few years ago, we decided to start making white wine. Is there a better place to do so than the very heart of the DO Rueda? In our winery Finca Montepedroso we make white wine exclusively from Verdejo grapes, using native yeast and ageing the wine sur lie for five months, with one stir per week. 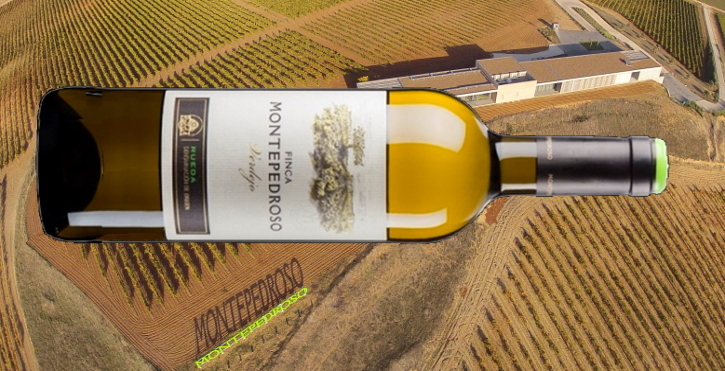 Our Finca Montepedroso is thus a fresh yet intense white that offers the best characteristics of the finest Verdejos. Finca Montepedroso Verdejo is light-bodied and dry, with a fresh, neat taste that is the result of balanced acidity. Its aroma has a silky nuance with fruity notes of apricot, peach and fennel. You will even notice a freshly-cut hay aroma and elegant mineral notes. In sum, Finca Montepedroso is the perfect example of Verdejo from DO Rueda, displaying all the traits that are to be expected of this wine. DO Rueda applies to wines made in a region situated in the central part of the depression formed by the Duero river. It comprises 72 municipalities, most of them in the province of Valladolid and the rest in Segovia and the north of Ávila. With an average altitude of 700 to 800 metres above sea level, the terrain is generally flat, with mildly rolling hills and large terraces of alluvial and diluvial formations on the banks of the river Duero and its tributaries. The region enjoys a continental climate characterised by very long, cold winters and hot, dry summers. As a result, the roots of the vines must go deep into the ground to find water. The first Designation of Origin to be recognised in Castilla-León, Rueda, produces white wine mainly. Verdejo grapes have been cultivated for centuries in the DO Rueda region. Even when there are no written documents, experts believe it was the Mozarabs who brought this grape variety to the area. Nowadays, Verdejo wines from DO Rueda are very popular in Spain, so much so that the terms ‘Verdejo’ and ‘Rueda’ are often used interchangeably. However, they are not the same: Rueda is a Designation of Origin and Verdejo, a grape variety. DO Rueda wineries have embraced night harvesting as the best way to pick grapes. Temperatures drop at night, which prevents the fruit from becoming flabby and makes it easier to pick and handle the clusters of crisp, ripe grapes. What’s more, the berries get rehydrated at night and so the alcohol levels in the wine will be lower. Finally, by picking the grapes when they are chilled, pickers are able to work faster, and the fruit reaches the tanks with all its properties intact. At Finca Montepedroso, we follow the night harvesting tradition, which ensures our wine has all the characteristics of Verdejo wines from DO Rueda. Verdejos from DO Rueda are crisp wines that clean and awake your palate. This makes them ideal companions for meals. Our Finca Montepedroso Verdejo pairs well with fresh seafood, white fish, rice-based dishes, pasta au gratin and white meat.